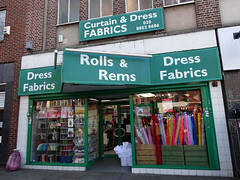 Friendly fabric shop on Lewisham High Street, with two other branches in Holloway and Edmonton. The shop is a just a breath away from chaotic, with a few large bins of super-cheap remnants at the front. Over the large ground floor there are a variety of fabrics at cheap to middling to reasonable prices, and a few special "expensive" fabrics (which are bargain-tastic compared to e.g. Berwick Street). This includes cotton, linen, poly-combo stuff, suit fabric, etc. The back of the shop has novelty fabrics such as monster fur and vinyl/tablecloth material. The top floor is smaller and has lots of curtain fabric, blanket/quilting and sheet fabrics and some bridalwear type of things. On Bec's September 2007 visit there were also some Halloween themed fabrics (that I was told are there year round). The shop also stocks a good supply of trimmings (zips, snaps, thread, elastic by the metre) and the staff are very eager to offer help and advice for any level of sewer. Accessibility: No step to get in to the front part (where the till is). The back of the ground floor is at a higher level, and although there's a ramp to get up there, it's a very steep one. The space inside is quite cramped, filled with displays of fabrics and trimmings. There also doesn't appear to be any step-free access to the top floor. Last visited by Kake, June 2018. Last edited 2018-09-08 20:29:56 (version 13; diff). List all versions. Page last edited 2018-09-08 20:29:56 (version 13).